Call it an inspiration. Sandy was leafing thru the pages of Scientific American when she happened on an article about Emanuel Rifkin, a Salt Lake City CPA, who decided to build a geodesic dome in the Utah dessert out of matzo. One can only guess that Rifikin (one of nine Jews who live in Utah) ordered more matzo than he needed for his Passover table. Hoping that he was going to make a financial windfall, he had been pleased when he had cornered the market in matzo for all the mountain states, and at the close of the Passover he peered out his kitchen window to pallets of matzo boxes stacked up on his driveway. What to do with the extra boxes of matzo? After all, one only uses one or two boxes of the stuff during the eight day holiday. That is, unless you live in Brooklyn and are feeding the entire congregation of B’nai Tsuris… then you might use up to nine boxes. But as already noted, the Rifkins lived in Salt Lake City! Perhaps it was to be expected when Rachel (his wife of 17 years) suggested that Manny find lodgings elsewhere. And that is when the ambitious Rifikin, armed with R. Buckminster Fuller’s blueprint for a geodesic dome, loaded up his matzo into a ten-wheeler and headed for the desert. And to the amazement of all, build it he did! Further, he saw that when he was in the finished dome he felt an unmistakable calm as he rested from his labors. Surrounded by walls of matzo and in the desert air his skin tightened and he felt rejuvenated. The salutary effect was real. It wasn’t long before word spread about this curious structure in the middle of “nowhere”. The newsprint media covered it. Reported to be better than a salt cave, health nerds began traveling to his doorstep, and paid a high fee to spend two hours in his matzo dome. The Hollywood glitterati soon began chartering flights to Salt Lake City. You get the idea. Fortune follows the brave! One can only imagine Manny Rifkin in the Utah desert sipping a chilled Mogen David and counting his Ben Franklin’s. Who would have thought? Matzo Therapy! And now to Sandy. She read this article when our pantry also had a modest surplus of matzo. We had purchased five boxes in advance of the Passover Holiday and had overshot our needs by 3.5 boxes. The words of the article danced in her head as she put the finishing touches on her latest coloring project. This coloring “thing” has captured Sandy. She sets up shop on the kitchen table. Spreads out a stout collection of pens, pencils, markers and fine brushes in front of her… selects an elaborate drawing and spends a couple of hours coloring it in. With music playing in the background (or the news on the kitchen TV), she is the picture of contentment. Coloring therapy? And the finished products are really good. Maybe it was just a natural progression of thinking… the article in Scientific American, a pantry with too much matzo, and maybe a touch of “matzo induced constipation”? Sort of simple, really. Sandy decided to make use of the unwanted matzo, and she put her coloring talents to creating matzo art! You could say it was a new form of matzo therapy! This first piece of matzo art was made while listening to Pachelbel’s Canon in D.
Next, Sandy applied herself to capturing the likeness of the first Hebrew Super Hero: Constipator the Great. The roots of this legendary figure are indeed linked to the biblical Exodus story. We have learned that the Hebrews had to flee Egypt in a hurry before Pharaoh reversed his decision to let Moses’ people go. “They could not tarry”. The bread was not allowed to properly rise, and so the Hebrews had to settle to making a flat “bread” – matzo! However, a considerable excess of this “bread” had to be left behind. And it was said that the Egyptian host spent days gorging out on matzo and the charioteers, archers & foot soldiers suffered from serious bloating, twisted bowel syndrome and painful rectal itch. Pharaoh’s army was completely incapacitated before leaving the gates of Egypt. No need for Moses to split the Red Sea for the escaping Hebrews. That was clearly an unnecessary literary device exploited by Cecil B. DeMille. 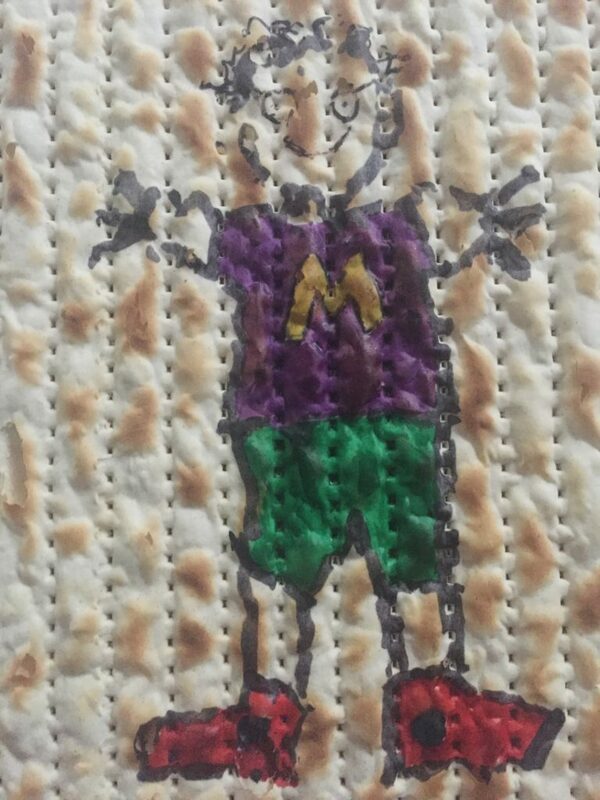 The savior for the Hebrews was Matzo Man! Sandy followed Matzo Man with a piece of three dimensional art. On a plain matzo board she placed four slices of American cheese, which she said represented the Four Horseman of the Apocalypse. Then she applied a quantity of scrambled eggs, which she said represented the Turmoil caused by the Rangers giving up the tying goal with 17 seconds left in the game. And a sprinkle of Tabasco Sauce, which she said represented a mistake. N.b. The bacon-like objects I photo-shopped in. Made while listening to Al Roker’s weather report. After breakfast Sandy returned to two dimensional art. I asked her to knock-off my favorite Georges Seurat canvas. 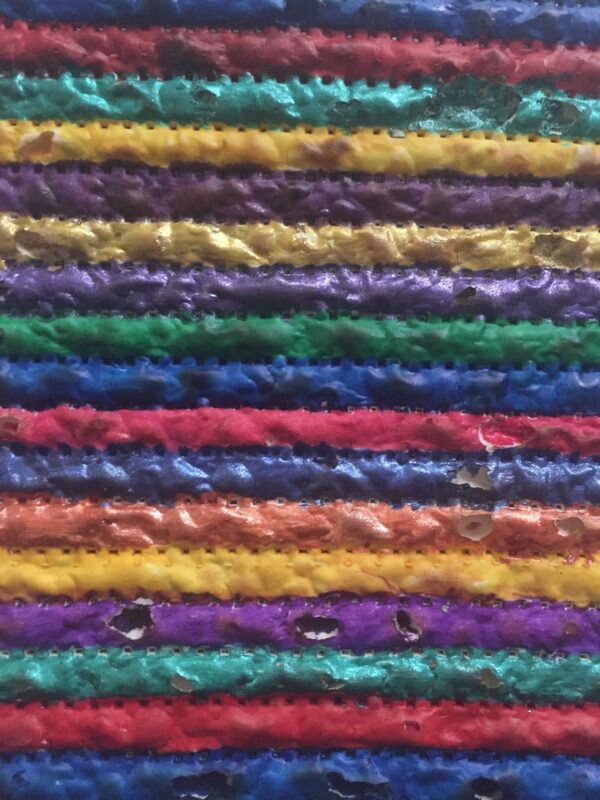 She agreed; but first she wanted to find a way to overcome the handicap of coloring on matzo’s irregular surface. Particularly the perforations. 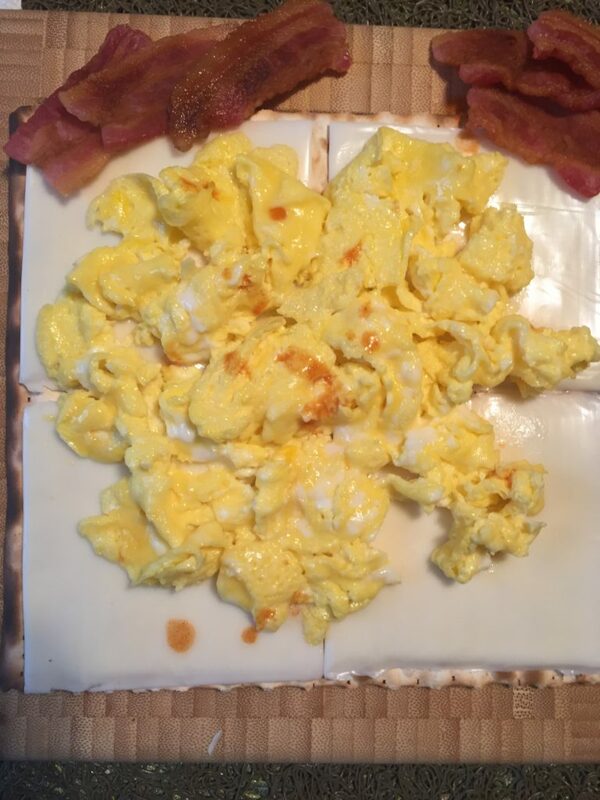 The problem was solved by mixing matzo meal and anchovy paste and applying it to the matzo board. Voilà! An ideal surface to use! The results are uncanny! Her best piece of art to date! 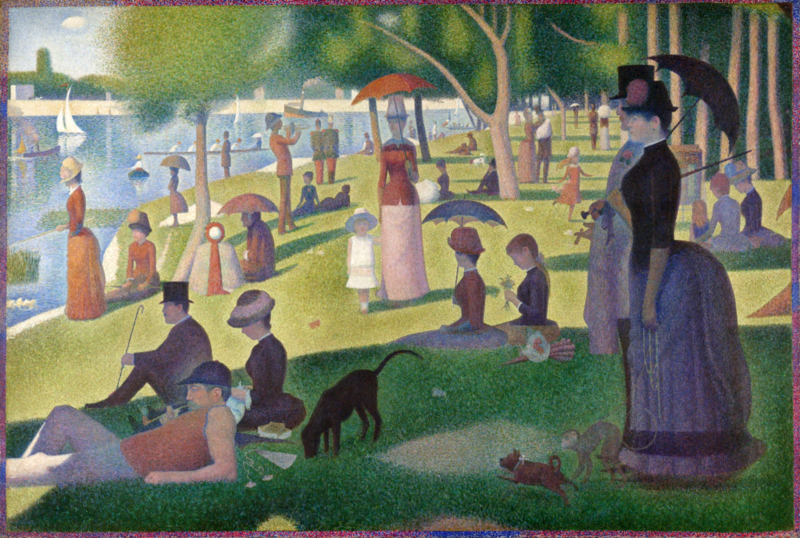 How to follow up that superb rendition of Seurat? First, let me say I don’t want to limit Sandy’s enthusiasm for her art. But she may have over-reached her skill set. 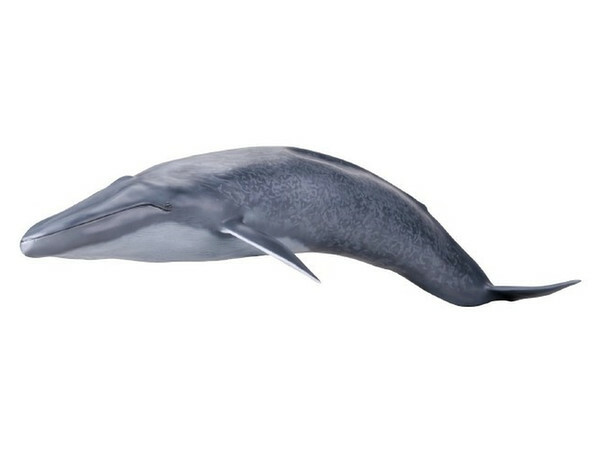 But she is set on giving this a “go.” We have just taken a long term lease on a vacant aircraft hangar at Oxford Airport, and Sandy has decided to make a 1:2 scale model of a Blue Whale out of matzo. Costco has agreed to sell us 30,000 boxes of their surplus matzo. We were able to get a very good price, even better than their usual low price. The trucks arrive next week, the sound system will be installed by mid-May, coloring will begin in June and construction will follow in November. Stay tuned.